"The Adult Down Syndrome Center is again thankful for the support of Graziano's Brick Oven Pizza. Graziano's generosity has helped the Center's effort to provide medical, psychosocial and advocacy services for over 5,500 adolescents and adults with Down syndrome," says Dr. Brian Chicoine, Family Medicine physician at the ADSC. NILES, Ill., Oct. 8, 2014 (SEND2PRESS NEWSWIRE) — What if you could have a great meal, and do good at the same time? 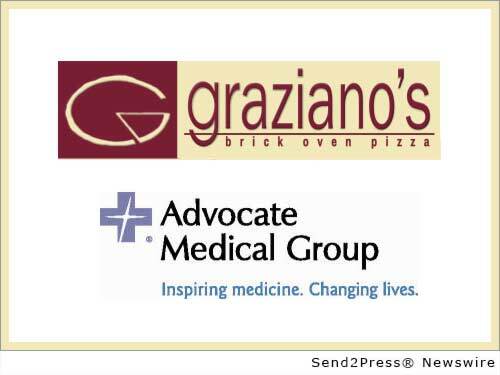 You can, because Graziano’s Brick Oven Pizza continues to celebrate its 20th anniversary year by raising funds for Advocate Medical Group’s Adult Down Syndrome Center in October. When guests mention the Adult Down Syndrome Center to their Graziano’s server, 20 percent of their total food and beverage spend will be donated to the Center. This special offer extends the entire month of October, which is Down Syndrome Awareness month. In addition, a special evening fundraiser is planned for October 28, 2014 at Graziano’s. From 5-9 p.m. that evening, guests who contribute $25 to the Adult Down Syndrome Center at the door can meet other supporters of the Center, as well as staff and doctors. Appetizers, wine, beer and soft drinks will be provided. All proceeds will benefit the Adult Down Syndrome Center. Graziano’s has a proud history of community involvement, supporting local schools, religious and charitable organizations. In addition, Graziano’s is actively engaged in raising money for charities for individuals with developmental disabilities such as The Adult Down Syndrome Center at Lutheran General Hospital, Orchard Village and Misericordia. Located on the campus of Advocate Lutheran General Hospital in Park Ridge, Ill., the Adult Down Syndrome Center (ADSC) is a comprehensive medical resource center for patients with Down syndrome. Their goal is to enhance the well-being of adolescents and adults with Down syndrome through a team approach in providing health care services. “The Adult Down Syndrome Center is again thankful for the support of Graziano’s Brick Oven Pizza. Graziano’s generosity has helped the Center’s effort to provide medical, psychosocial and advocacy services for over 5,500 adolescents and adults with Down syndrome. In addition, it brings attention to the national celebration in October of Down syndrome Awareness month and highlights the work of the Adult Down Syndrome Center,” said Dr. Brian Chicoine, Family Medicine physician at the ADSC. Graziano’s, at 5960 W. Touhy, Niles, IL, is a neighborhood Italian restaurant featuring pasta, fresh fish, steaks and pizza made in wood-fired brick ovens. They bake their own breads, make their own sauces, soup and dressings from scratch in the restaurant. They do not use whiteners, preservatives or MSG in any of their products. They deal primarily with local suppliers that share their commitment to quality. More information is available at http://www.grazianosrestaurant.com/. Located on the Advocate Lutheran General Campus, the mission of the Adult Down Syndrome Center is enhancing the well-being of adolescents 12 and older, and adults with Down syndrome using a team approach to provide comprehensive, holistic, community-based health care services. Its multidisciplinary team has served the health and psychosocial needs of more 5,500 adolescents and adults with Down syndrome since the center opened in January 1992. Original Keywords: Grazianos Restaurant, Adult Down Syndrome Center Graziano’s Brick Oven Pizza Niles Illinois NILES, Ill.
REFERENCES: Corporate Social Responsibility News, Grazianos Restaurant, Adult Down Syndrome Center Graziano's Brick Oven Pizza Niles Illinois NILES, Ill.